Powerful, portable and personal with a gorgeous 9.7-inch Retina display in a thin, durable aluminium design that weighs less than half a kilo. 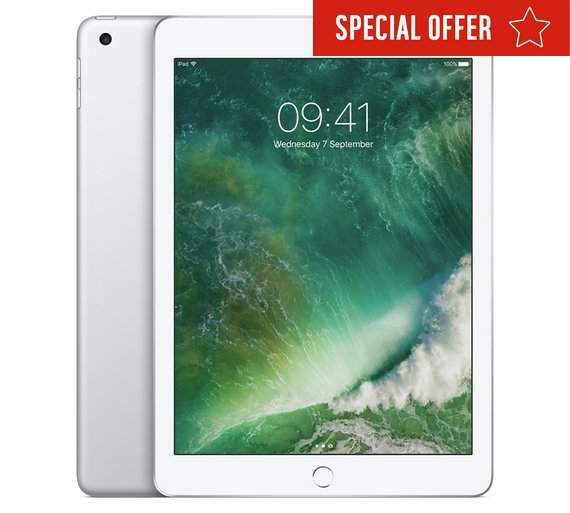 iPad puts incredible capabilities in your hands with a powerful A9 chip, 8MP camera, FaceTime HD camera, Touch ID, Apple Pay and Wi-Fi, 3 all-day battery life, and over a million apps on the App Store. Flat-out productive. iPad is a scanner. An accountant. A presentation expert. A personal assistant. Practically whatever you need it to be. With a stunning 9.7-inch multi-touch retina display, iOS 10, thousands of productivity apps and wi-fi — all in a thin and light design — iPad can transform the way you do business. LED backlit display with iPS technology. 2048 x 1536 resolution at 264 pixels per inch. Support for simultaneous display of multiple languages and characters. Uses the latest iOS operating system. Up to 10 hours battery life (depending on usage). Standard price plus their voucher as a deal? So we gonna post every product on Argos website? Hasn't it always been this price? Same price everywhere, including Asda. Use eglobal. Got mine for £255. Arrived today factory sealed and well packaged. Use eglobal. Got mine for £255. Arrived today factory sealed and well …Use eglobal. Got mine for £255. Arrived today factory sealed and well packaged. Do you get UK warrenty? Think so. Others commented you do. Was posted on a hot uk deals. Can I compare this with a £20 android tablet and say how expensive this is in comparison; like all the iPhone guys jumping on cheap tablets and phones because they don't have the features of an iPhone 8, 9, 10, 100, whatever the latest is? Can I compare this with a £20 android tablet and say how expensive this is …Can I compare this with a £20 android tablet and say how expensive this is in comparison; like all the iPhone guys jumping on cheap tablets and phones because they don't have the features of an iPhone 8, 9, 10, 100, whatever the latest is? Nah, you're better than that! Ordered on the 19th arrived 28th. Delivered by UPS. Tracking details were emailed to me.